The low-code development platform is becoming increasingly popular thanks to its ability to enable even LOB users without a developer’s experience to build mobile apps quickly and easily. 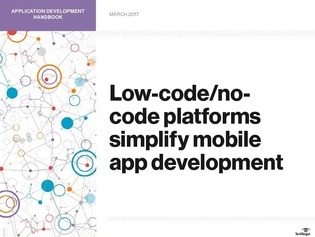 This expert handbook takes a look at how low-code development platforms are becoming more prevalent in organizations looking to expand their web and mobile development options. Learn why low-code/no-code with drag-and-drop visual capabilities should be a welcome alternative for software developers and a simplified method for non-developers.